An international exhibition project ‘The Ways of Skaryna with Belgazprombank’ runs in the European cities connected with the life and activity of the first Belarusian and East-Slavic book printer Francysk Skaryna. It’s aimed to demonstrate an important role of the Belarusian culture in the European context. The Project is dedicated to the 500th Anniversary of the Belarusian Book Printing included into the list of anniversaries celebrated in association with UNESCO in 2017. The project ‘The Ways of Skaryna with Belgazprombank’ started in the Palace of the Grand Dukes of Lithuania (Vilnius) where the exhibition has being held from 4 May till 4 June 2017. The Project includes presentation of original publications of Francysk Skaryna from the collections of Belgazprombank and the National Library of Belarus, concert of ancient Belarusian music by the ensemble ‘Vytoki’, premiere of the documentary ‘Francysk Skaryna. A Man of the World’ and journey through the virtual museum ‘Typography of Francysk Skaryna’ (with the help of VR headset). Belgazprombank demonstrates at the exhibition one of its most recent acquisitions which filled in its corporate collection – The Small Travel Book published by Skaryna. The National Library of Belarus brings on show other important Skaryna’s publication – The Book of Job. The Small Travel Book, which was printed by Francysk Skaryna in Vilnius around 1522, is considered to be the first book published in the territory of the Grand Duchy of Lithuania that comprised Belarusian lands. Today the only copy of this book in Belarus is kept in the corporate collection of Belgazprombank. The Small Travel Book represents collected church books of small size (22 books collected under one cover) with services for each day of the week. They were intended for believers who were travelling and, according to researchers, for itinerant monks as well, to enable them celebrate a monastery service. The books are decorated with unique engravings, headpieces and initial letters. 9 books have afterwords written by Skaryna himself. Around 1520 Francysk Skaryna arrived in Vilnius and, with the support of burgomaster Jakub Babič, published the Small Travel Book around 1522 and the Apostol in 1525. It is assumed that Skaryna’s printing house in Vilnius was situated in a building at 19 Didžioji St., where a memorial plaque dedicated to the Belarusian printing pioneer is installed. There is a consensus among researchers of Skaryna’s activity that constituent parts of the Small Travel Book are separate editions because each of them has its own foliation (pagination) and most of them have their own title pages. 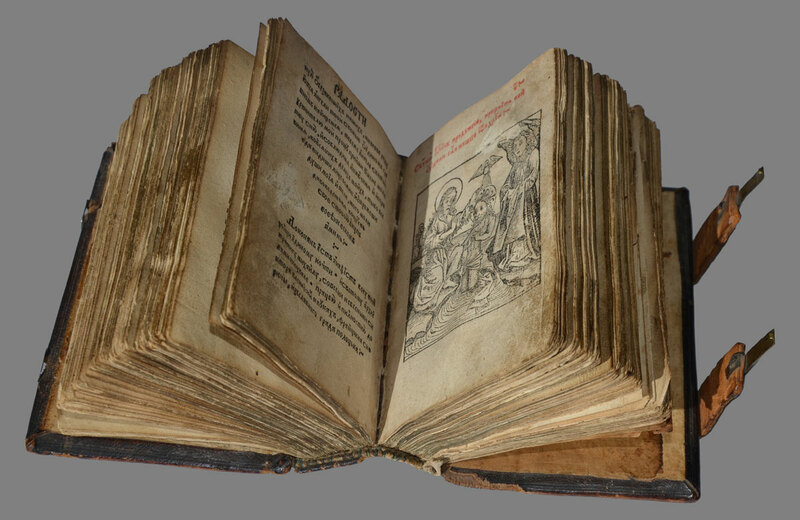 Thus, F. Skaryna printed at least 23 books in Vilnius: the Psalter, the Book of Hours, 18 akathists and canons, the Hexameron, the Triodion and the Apostol. No full copies of the Small Travel Book survived. The most complete copies are kept in the Russian National Library in St. Petersburg (22 books), the corporate collection of Belgazprombank in Minsk and the Royal Library in Copenhagen (18 books in each). Apart from the copy from the corporate collection of Belgazprombank, engravings ‘The Baptism of Our Lord’ and ‘Christ Teaching Judaic Religious Teachers in the Temple’ survived only in one variant in the University Library in Kraków. The Book of Job was the second edition printed by Francysk Skaryna in Prague: it was published on September 10, 1517. In the foreword to the edition, Skaryna noted the practical importance of the Book of Job: ‘And every man should read because it is a mirror of our life, remedy for the soul, consolation for all in sorrow, especially for those living in deprivation and suffering from diseases, true hope for resurrection of the dead and eternal life’. In the final part of the foreword, the book printer put his name to his work, calling himself not by his official name Francysk, but by his colloquial name Francišak, which probably was more habitual to him: ‘Therefore, I, Francišak Skaryna’s son from Polatsk’. At the end of the book, Skaryna gave an afterword, which was traditional for his editions, with an indication of the exact place (‘In the old City of Prague’) and date of the edition (‘Year … one thousand five hundred and seven, on the tenth day of the month of September’). Skaryna was also sufficiently exact and unambiguous in defining his role as the originator and the publisher: ‘By order and through the work of and rendered by the chosen man, Doctor of Medical Sciences Francysk, Skaryna’s son from Polatsk’. The foreword and afterword to the edition were written in the Old Belarusian (‘Ruthenian’) language, while the main text of the Biblical book was translated by Skaryna into the Church Slavonic language in its Belarusian version. Number of printed copies of this edition is unknown, but it is unlikely that there were more than 1000 copies. 12 copies of the Book of Job are known in the world today. These books are kept in the Library of the Russian Academy of Sciences, the Russian State Library, the National Library of Russia, the State Historical Museum, Russian State Archive of Ancient Acts (all of them are in the Russian Federation), in the A. Sheptytsky National Museum in Lviv (Ukraine), in the National Library of Belarus in Minsk.